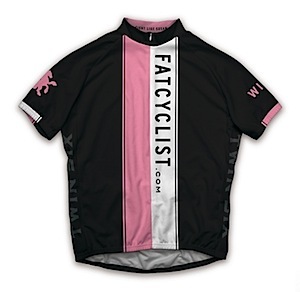 A Note from Fatty: The new Fat Cyclist jerseys and shorts and bottles and hats and everything have all been shipped out. If you pre-ordered any of the 2013 gear, it should either have arrived or be darned close. And if you didn’t pre-order, well, you’re still in luck. Jerseys, bibs, socks, caps, jackets, vests and bottles are now in stock. In both mens’ and womens’ sizing, in most sizes. I’m going to come out and say it: I love all my Fat Cyclist jersey designs, but this is the one that is in fact the most slimming. Plus, there’s that whole neapolitan ice cream thing. Anyway, I recommend you get yourself one. Or two. You know, maybe a size larger. Just in case, because — as you know — Winter is coming. Read here for details, and click here to go donate. Thanks! Before I begin my poem, here’s a nice little video (looks better viewed big, though) I made of The Hammer, The IT Guy, and me riding Corner Canyon earlier this week. I think it may in fact be a better ode to mountain biking in autumn than my sparkling prose, if that’s possible. And now, the poem. In italics, to make it seem more emphatic. I need to hit that trail, which one(s) is(are) it(they)? Wow, almost sprained my thumb typing that. Watching the video I also feel like I did when I was a kid in the back of our Station Wagon. You know, the one with the 3rd seat that faced backwards? The kit arrived last week and it fits! First ride tomorrow wearing it! But seriously, that was a mtb ride? Where are the rocks, roots, waterbars, and ruts? That just looked like one long, glorious, sun dappled, flowing trail. But that might just be my jealousy showing. I couldn’t ride most of the month. I’m on the bike again. I lost my summer fitness. the best year of riding I’ve had. because I took nothing for granted. I tried to enjoy every ride to it fullest. and conquered some of her inner fears. and hit the Park City trails. and likes to climb big climbs. and looks freakin’ awesome in bike shorts. The Joy of the Lord will last forever. More power to you.. but when is it you work at your “real job”? More closeups of the IT guy…that’s all it’s lacking. Video is great but the music choice this time…hm, hm. Did you mean “retro” as in “retrospective”? To warm my sore and chilly bum. That’s all I really have to say. First mtn bike ride ever today. A new appreciation for you, Fatty, too. All under fat tires to me are new. Beautiful sun, cool breezes, around the lake we went. ‘Tis hooked I am this Autumn on a forest path. so distracted by the beauty view. Loved the video. We don’t have technicolor autumns like that here in Texas. And also loved the Haircut 100. Cool. Great video! So beautiful… Makes me jealous. I went out to try the backwards facing camera myself. Noticed quite quickly that our climate makes it impossible. Makes me even more jealous. it’s always fun it never fails. upon my love you can depend. so we can always ride again. as I spin these wheels around. some in youth relived again. Life is but a mystery. just how good this world can be. a myriad adventures sweet and keen. O how I miss thee! snuggling at the football game.